Only for true horseradish lovers! 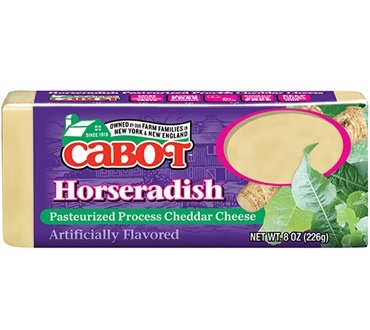 The biting pungency of horseradish is skillfully tamed by the smooth nuances of this youthful cheddar. Enjoy the richness of this creamy cheddar with a potent bite. 1. In large pot, cover potatoes with cold water and bring to boil. Lower heat to maintain gentle simmer and cook potatoes until tender, 15 to 20 minutes. 2. Meanwhile, heat butter and cream in small saucepan until butter is melted. 3. Drain cooked potatoes and return to pot. Mash with hand masher. 4. Add sour cream, cheese and enough of butter/cream mixture for desired consistency (do not over-mix or potatoes will be gummy). Season with salt and pepper.Serve with Meatloaf. I love to slice this cheese and serve on crackers. I buy this product often. This cheese is perfect as a flavor enhancer to beef and pork. When served as an Hors d'oeuvre, it always causes surprise and a desire for more.